LAS CRUCES, N.M. – The New Mexico State football season is less than 42 days away, as the Aggies currently hold summer workouts before the start of fall camp on Aug. 1. This season, a hand full of the Aggies’ six home games will feature themes and fun activities for fans to enjoy before the game. 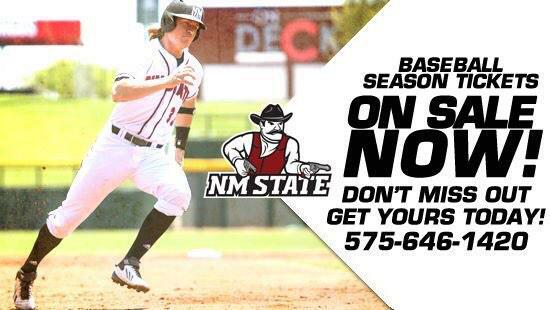 NM State kicks off the season on Thursday, Aug. 28, with Cal Poly at 6 p.m. The New Mexico Department of Agriculture will sponsor that event, hosting Ag Day, which will include more than 40 booths highlighting different areas of New Mexico Agriculture. The Aggies’ in-state rival New Mexico visits Las Cruces on Saturday, Sept. 20 at 6 p.m., as Wells Fargo sponsors the annual I-25 Rivalry Game. Currently, the Aggie Athletic Club is putting together a Football Alumni Reunion, which is open to all eras of Aggie Football Alumni, Sept. 18-20. The reunion will include activities such as tours of the renovated Coca-Cola Weight Center and new field turf as well as a meet and greet with the NM State football staff. If you are a former NM State football player and would like to be a part of the festivities, please call the Aggie Athletic Club at 575-646-5151. The annual Tough Enough to Wear Pink game is Oct. 4 at 6 p.m. as the Aggies face off against Georgia Southern. This year marks the eighth season that NM State Athletics teams up with Cowboys for Cancer Research to raise money for cancer research. Since 2007, more than $3 million (cash and in-kind contributions) have been presented to C4CR and the “NMSU Aggies Are Tough Enough to Wear Pink” campaign has become the largest event of its kind in the world. During that week, TETWP events will include, a Donor Gala at Double Eagle de Mesilla, the 2014 TETWP “Shop for the Cure” at the Pan American Center, the 2014 Sodexo Luncheon & Emerald Isle Fashion Show at Pan American Center and the 2014 Cervantes Fun Run & Walk at Aggie Memorial Stadium. Saturday, Nov. 1, will be the fourth home game of the season for the Aggies and also Military Appreciation Day. The game, sponsored by El Paso Electric, is set for a 6 p.m. kick-off as NM State faces Texas State. NM State will pay tribute to all active and former military personnel for their dedication and sacrifice. The Aggies host Louisiana on Saturday, Nov. 8, at 6 p.m., in the annual Homecoming game. Although Saturday’s football game is the center piece of the weekend, homecoming to an opportunity for not only athletic alumni to come back to Las Cruces, but for all Aggie alumni to come home to the Mesilla Valley to show their support for their alma mater. The Aggies’ final home game of the season will be Saturday, Nov. 22, at 6 p.m. against UL-Monroe. More information on activities for this game will be available at a later date.